Operation Shanti Ambassadors are individuals who make significant, continuing and selfless effort on our behalf. They believe in our mission and vision and in how we conduct ourselves. They have contributed in many ways, including fundraising and helping out with our programs, but most importantly they spread the word about our work beyond what we could possibly hope to do ourselves. Matt first became involved with Operation Shanti’s kids in Mysore, India in 2006. Since then, Matt has been a strong and consistent supporter of our programs by hosting fundraisers in the UK, visiting and helping out when in Mysore, and by spreading the word of our work. Matt started with Project Street and taught yoga to our street kids right on the sidewalk. When in Mysore, Matt is a frequent visitor at our children’s home and is constantly thinking of ways to help us in our charitable efforts. Since 2002, Matt has taught yoga in Manchester, UK at his studio, Yoga Manchester. He is currently a level 2 authorized teacher in the Ashtanga yoga lineage as taught by Sri. K. Pattabhi Jois and comes to Mysore when personal obligations permit to further his practice. We appreciate Matt’s dedication, focus, and attention to our efforts for so many years! We met Nassera during her first trip to Mysre in 2007, and she has been supporting Operation Shanti since then. Nassera has been a frequent visitor to Mysore and helps out whenever she is in town. Nassera sponsors a number of our girls and enjoys communicating with them. She is especially concerned that they grow up into fine young women. Nassera is an authorized Ashtanga yoga teacher in the lineage as taught by Sri. K. Pattabhi Jois and donates a percentage of her income from teaching yoga to Operation Shanti. She recently moved from Singapore to Zurich, Switzerland, where she opened her own school, Ashtanga Yoga Zurich. We are forever grateful to Nassera for her genuine care and concern for our children and our programs over the years. Shirly and Adeline first got involved with Operation Shanti when they met one of our U.S. officers who was visiting Mysore in 2009. They became fast friends and soon after, Shirly and Adeline were helping the kids paint our ABC room – a small brick structure that we use as a classroom. During their trips to Mysore, Shirly and Adeline have become a welcome presence at Karunya Mane and have continued to decorate our home with really cool paintings and murals! Even when not in Mysore, Shirly and Adeline – two popular yoga teachers who founded and operate Satya Yoga in Singapore – dedicate time to spreading the word about our work and hosting fundraisers for us. We greatly appreciate Shirly’s and Adeline’s – and their students’ – continuing dedication and support of our efforts in Mysore. Tarik believes in giving back what he can to India, in exchange for the gifts that his yoga practice has given to him. When in Mysore to further his practice, Tarik spends his free time on Sunday afternoons with our kids, drawing and painting, doing some yoga, and just enjoying each other’s company. Tarik is also committed to spreading the word of our work and fundraising for our kids. In recognition of his efforts with us and his strong following of students in Japan and worldwide, along with his kind-hearted nature, peaceful demeanor, lack of need for attention and fame, and just genuine nice-guy-ness, we’re really pleased to recognize Tarik as an Operation Shanti Ambassador! Tarik is a dedicated yoga practitioner, a certified teacher in the Ashtanga yoga lineage as taught by Sri. K. Pattabhi Jois, and a consistent yearly visitor to Mysore, India. Compared with the length of time that we’ve known our other ambassadors, Chris is relatively new to Operation Shanti. However, that fact does not diminished his effectiveness. Chris is a welcomed presence at Karunya Mane through the consistency and dedication that he shows in all of his efforts to help our kids, including teaching morning yoga classes, devising fun and entertaining English tutoring sessions for our most challenged kids, and just making the kids laugh with his sense of humor, comedic charm, and kid-like attitude toward life. Chris is more than just a teacher and playmate to the kids; we really appreciate his efforts at fundraising for us and in spreading the word of our work. Most of all, we love Chris’ intense desire to improve the lives of destitute children everywhere – and we’re grateful that he’s lending a hand to help our kids at Karunya Mane. Ashely Dorr, a licensed art therapist and yoga teacher, has more than 15 years of experience working with at-risk children in the New York area and with children and women worldwide who have been affected by trauma. Ashley is a frequent visitor to our children's home and when she comes, she brings bags full of art supplies and lots of ideas for great therapeutic projects for the kids. A few of our kids are fluent in English and they help Ashley by translating her words to Kannada, the local language. Ashley also helps with raising funds and spreading the word about our work. We're really grateful to have Ashley on board as an Operation Shanti Ambassador given her genuine desire to help at-risk kids like ours and her unending love for our little ones. Kavitha Mahtre has been an avid supporter and friend to Operation Shanti since 2011, when she contacted us and expressed an interested in raising significant funds for our kids through an impressive effort -- running the Goa half-marathon! Since then, Kavitha engages her co-workers every year in Bangalore, where she lives and works. She raises in-kind and financial donations for our kids, and spreads the word about our work. Kavitha truly enjoys what she does for our kids, and we appreciate her sincere, genuine, and selfless efforts to support our work in Mysore. Madhusudan Pattanaik has been helping our kids since he first met them years ago at a local hospital in Mysore (the kids were getting their physical exams). He was curious about their lives at our children's home and, since then, has made several contributions to our efforts-even after moving from Mysore to Bangalore for his career. Equally important, Madhusudan continues to spread the word about our work. A lifelong supporter and participant in charitable activities throughout India, we appreciate Madhusudan's continuing efforts to help our kids improve their day-to-day lives. We first met Andrew Hillam and his two young sons in 2014 when they came to play with our kids at our children's home in Mysore. Our kids must have had an effect on Andrew's family because he remembered them, and introduced them to one of his yoga students who is an expert at making jewelry-making accessible to at-risk kids like ours in developing countries. We're really excited and grateful to have Andrew as an Operation Shanti Ambassador given his dedication to India and its yoga practice and to supporting our charitable efforts in Mysore in any way that he can. Andrew, a student of Sharath Jois, is a certified teacher in the Ashtanga yoga lineage as taught by Sri. K. Pattabhi Jois, and is a frequent visitor to Mysore, India. Andrew currently teaches the Mysore Program at Jois Yoga in Encinitas, California. Ally is an Ashtanga Yoga teacher based in Clearwater, Florida, and has been traveling to Mysore since 2003 to study at the Ashtanga Yoga Research Institute. Ally is also a busy wife and mother of two, and believes that every child deserves the opportunity to blossom into their full potential with love, support, healthcare, education, and healthy nutrition. Ally said, "This is exactly what Operation Shanti is providing at Karunya Mane. I love visiting with the kids to play games, do arts and crafts, sing songs, or just get to know them and hear about their studies. I have had the great blessing of witnessing the dramatic positive impact of Operation Shanti's efforts in the children's lives and feel passionate about doing all I can to help ensure these efforts continue." We're very grateful to have Ally as an Operation Shanti Ambassador! 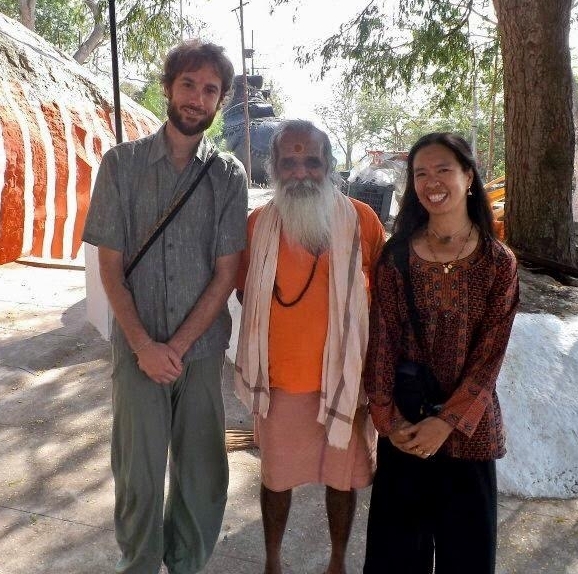 We first met Despina in 2011 in Gokulam in Mysore, India, the home of ashtanga yoga. Since then, Despina has been generously offering some of her Ayurvedic yoga massage (AYM) sessions to yoga practitioners as donations to Operation Shanti to help our kids and women. She also organizes fundraisers with the help of her massage students, and helps to spread the word about our work. Despina truly enjoys mindfulness practices, working with the body and exploring the body-mind relationship. Since 2009, she has practiced ashtanga yoga and travels to Mysore, India every year to practice with her teachers, Sharath Jois and Saraswathi Rangaswamy. We're very grateful to have Despina and her warmth and generosity as an Operation Shanti Ambassador! Frances Cole Jones is the author of "How to Wow" and "The Wow Factor" and President of Cole Media Management: specializing in personal presentation skills. She is also an authorized teacher for KPJAYI having received her blessing to teach from Sharath Jois in 2012. She teaches at Mandala Yoga Center for Healing Arts in Amagansett, New York. The kids met recently met Frances during her visit to our home and had a great time practicing their English with her and hanging out. Thank you, Frances, for your support as an Operation Shanti Ambassador! Meghan Kirk lives in the U.S. and runs a traditional Ashtanga Yoga program called Mysore Philadelphia. She is authorized to teach by her teacher, R. Sharath Jois of the Sri K. Pattabhi Jois Ashtanga Yoga Institute in Mysore, India. In addition to teaching, Meghan also works as an administrator and direct care provider at Spectrum Specific Services, an agency which her mother founded in 2014 to provide services for her brother, Tim, and other individuals with Autism Spectrum Disorder. Meghan lives with her husband, Jason, and their two dogs, Scrappy and Pixie (a street dog they brought home from Mysore) in the Fishtown section of Philadelphia. Meghan considers her practice to be a profoundly healing gift, and believes that once you have found health and steadiness in yourself it is then your duty to help others find the same. It is her great honor to help Operation Shanti in its wonderful mission in any way she can. Thanks, Meghan, for serving as an Operation Shanti Ambassador! Morgan is a nurse who works with kids who are privileged to have healthcare in the U.S. Since 2011, he has traveled to Mysore, India to study with Sharath at the Sri K. Pattabhi Jois Ashtanga Yoga Institute. That's an excuse to bring vitamins to and vaccinate the amazing kids of Operation Shanti so that they can remain healthy and thrive. Morgan lives on his sailboat and teaches in Los Angeles as the Ashtanga Nurse. Morgan is thrilled to be an ambassador for Operation Shanti, and the feeling is mutual! Whenever Danielle travels to Mysore, India to study at the K. Pattabhi Jois Asthanga Yoga Institute, she makes time to visit with the kids at Operation Shanti. Her genuine smile and easygoing, caring demeanor make her popular among our kids, particularly our girls, who make sure that she leaves her visits with them with a new hairdo! Danielle was introduced to yoga nine years ago by a friend and her dedication to her daily practice and study are evident in the interest that she takes in our programs in Mysore. For this, we are very grateful that Danielle is an Operation Shanti Ambassador, and we look forward to her future visits in Mysore! Danielle practices at and teaches the night program at Ashtanga Yoga Columbus (AYC). Thank you, Danielle, for being an Operation Shanti Ambassador! In her own words: "Being part of this fabulous project, Operation Shanti, is such an honor, truly. My participation is modest. I support this beautiful organization by teaching open yoga classes on a donation basis in Switzerland. Although my helping hand may be a drop of water in the ocean, I believe that every little bit helps and gathering forces can make a real difference. I have been travelling to India regularly for extensive visits. Giving back through contributions to this organization is a true joy and the least I can do. India consumed me more than 20 years ago, at the age of 17. Like many, I couldn’t stop going back for another fix of what was shaping me into a better being. India opened my eyes, made me strong, and at times broke me, too. I learned exotic cooking and philosophy. After being a cook, a tailor, and so much more… after several journeys to India… I was introduced to yoga. Finally, India carved me into a yoga teacher. To this day, I keep returning to learn and further grow as a human and teacher. This is my humble thanks to this marvelous subcontinent and its joyful children, for all it has given to me. I could never give enough back." We met Pam during one of her stays at her winter home of Mysore, India. Previously, Pam was a registered nurse with a specialty in HIV and, after receiving her MBA from the Kellogg School of Management, worked for a large pharma for a few years. After a few years in the corporate world, Pam decided that she needed a more balanced lifestyle and started Anokhi Green, a company that designs custom malas and gemstone jewelry using raw materials and vintage pieces from India. Her clientele includes yogis who travel to Mysore from the West and many in the U.S. who follow her adventures in India. In 2017, Pam visited the children at Operation Shanti and wanted to do more because she views education as way out of the cycle of poverty (especially for girls), and is committed to supporting our charitable efforts. We're very excited to have Pam as an Operation Shanti Ambassador and look forward to her visits every winter to Mysore! We met Marque on one of his trips to Mysore to practice yoga. Marque is a dedicated student and teacher of Ashtanga yoga, and just a really great guy. When Marque met our kids, they immediately took to him (and his long hair, which the little girls loved to make into braids!) and he to them. Marque has 20 years of climbing and mountaineering experience and did a 4-year tour with the United States Marines before dedicating himself to Ashtanga yoga and co-founding Great Lakes Ashtanga Yoga in Ohio. Marque, his wife Sarah, and their adopted Indian street dog Chai, love to travel for climbing trips and to share their love of yoga. We're really excited to have Marque as an Operation Shanti Ambassador and look forward to his future trips to see our kids! My introduction to Operation Shanti was on a trip to study yoga at KPJAY, when a friend told me about the incredible work OS is doing to help the most vulnerable in Mysore. Through helping the elderly and providing destitute children with the most basic tools we all need to succeed in life - food, shelter, education and a loving, safe, supportive environment - OS is helping create more hopeful futures for so many. Upon returning home, I figured the best way I could help OS help others was to raise funds. As a yoga studio owner in Toronto, Canada, I have dedicated the funds earned in our Karma classes to OS, and a couple of times a year we mobilise our incredible yoga community for fundraising events. Not only do we benefit from getting together, but also from knowing we are giving back to those in need in Mysore -- the birthplace of Ashtanga yoga, a practice from which we have all benefitted immensely. Joseph has become a good friend to the kids in our children’s home, Karunya Mane, over the past couple of years, and he visits them when he is in Mysore practicing yoga with Sharath Jois. Joseph enjoys time with our kids in the same manner that he teaches yoga—with feet firmly in traditional and fun sports and games, and with positive hopes for their futures! Joseph is a kind-hearted individual who has grown personally through his yoga practice and teaching, and he offers that strength and guidance to others in need. We’re very grateful to have Joseph as an Operation Shanti Ambassador! Amy Santos has known Tracy Kunichika since 2003, and was a captive witness to the initial planting of the seeds that would become Operation Shanti. Amy’s spiritual guides Mata Amritanandamayi, K. Pattabhi Jois, R. Sharath Jois, and Swami Jamanagiri have all inspired her to live her best life with devotion, hard work, a sense of humor, and most importantly, compassion and service to other beings. Steven Ferrara first learned of Operation Shanti through his beloved teacher, Swami Jamanagiri. Swami taught Steve that selfless work in the benefit of others is always more personally beneficial than any other work. It is in this spirit and his recommendation that Steve has worked with Operation Shanti on all of his extended trips to Mysore. Steve met Tracy for the first time in 2005 when Amy and Steve helped to deliver food to Gowri Shankar Nagar colony. They have since couriered school supplies, medicine, and financial donations from their friends, colleagues, and students in the West to Mysore upon each visit. While visiting Karunya Mane children’s home, they do interactive music programs with the kids. They also hold local NYC fundraising events. When home in Brooklyn, Amy is a KPJAYI level 2 authorized ashtanga yoga teacher and Steve is a professional musician.